WordPress, which powers over half of the entire Internet today, is getting better and stronger day-by-day with several new incredible features added to it after every update. However, if you’ve ever noticed, most of the WordPress updates are either about fixing potential security issues or enhancing user experience. While 2016 was dominated by the discussion of video headers, hamburger menus, one-page (parallax) themes, REST API and others, WordPress has brought a lot of new exciting things for both developers and users in 2017. 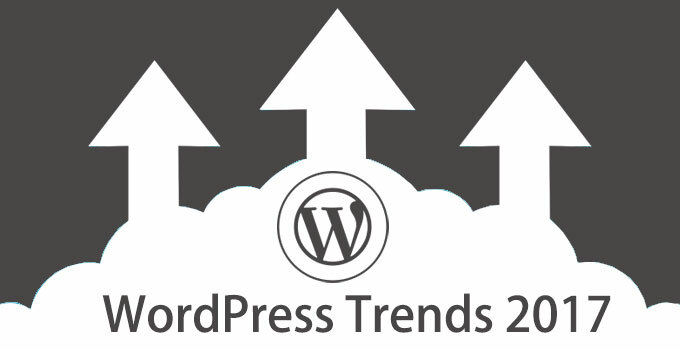 Let’s look at what’s trending in WordPress arena right now! Being a veteran WordPress developer, you must have already heard of mobile-first design before. For those who are not familiar with the mobile-first approach, this means designing a website primarily with mobile devices in mind and then scaling it up for desktop use. With nearly 70% digital media consumption is from mobile devices, it would be wise for any WordPress professional to meet the demand of a majority of users in 2017. While ‘responsive design with a mobile first approach’ is only the first step to cater to users’ needs, the idea of age-responsive web design is all about making sure the website will look, behave, and display content according to the personal needs or age of the user. Perhaps you have not implemented this new game-changing technique yet, but if you want to make your WordPress website accessible to everyone, the age-responsive design is something you will have to adopt eventually. As security has always been a matter of great concern to website owners, WordPress in every update takes all possible stringent steps to make the security tighter than ever before. Since the beginning of the year, WordPress has not only been recommending users to go with only those hosting companies that offer SSL by default, but it has also been rolling out many new features (such as API authentication) which require a website to have HTTPS protocol available. Moreover, back in 2014, Google had announced to use HTTPS as a ranking signal and now, it seems to make Certificate Transparency mandatory for all websites by the end of 2017. If you’re aware, starting this year, Google started marking HTTP websites that collect passwords and other sensitive data as ‘Not secure’. Considering all these factors, integration of HTTPS to your WordPress site is imperative, especially if you’re collecting any kind of sensitive information or running an eCommerce store using WooCommerce. Over the last couple of years, there has been a significant growth in the number of WordPress themes and plug-ins developed as Software as a Service (SaaS). Even, some older and popular standalone WordPress plug-ins are now making their move to the SaaS over one-off payment – the traditional approach of selling a product or service. Looking at its popularity, there is no doubt SaaS will continue to grow as a new WordPress development model in 2017 also. One of the best things about the SaaS model is that it gives subscribers the opportunity to use better and more secure software with advanced functionality at affordable prices. In other words, it is ultimately a win-win solution for both developers and users; developers get a reliable source of continuous income and users receive free lifetime support and updates for the software they’re using. As a developer, if you want to switch to SaaS, we highly recommend you first be familiar with all the pros and cons of the SaaS model. Thanks to the rising popularity of module-based themes that provide Drag and drop facility, WordPress users are no longer restricted to using predefined sidebar layouts. Harnessing the power of the latest HTML5 and CSS3 components, this amazing feature opens up a whole new world of customization possibilities for users who don’t have extensive WordPress development knowledge. Actually, this is such a great feature that finally broke the tradition of publishing only blog-like content on a WordPress-powered site. Essentially, drag-and-drop page builders give you the complete control over most of the design elements of your website, obviously without affecting its underlying structure. Not only you can build your website the way you like, but also you have the ability to display exactly what you want. Nonetheless, the main objective behind the invention of this fantastic technology is enhancing website’s user interface while simultaneously saving WordPress users’ precious time. Expect this trend to become even more popular in upcoming years! Where WordPress.com already allows users to add VR and 360-degree content to their websites, on the other hand, some developers have come up with some promising WordPress plug-ins for using VR with a self-hosted website. This proves the possibilities of incorporating VR functionalities into WordPress are endless. Although this concept is quite new to WordPress, it will definitely see a rise in the near future. Interstitial Anxiety is a term that you must have heard many times since the beginning of the year. It refers to a temporary state of tension that a user feels between taking an action and getting a response from the system. The longer the wait, the higher are the chances of a user getting frustrated and leaving the website. If left unaddressed, Interstitial Anxiety can wreak havoc with your bounce rate, leading to a lower ranking search engine results. Microinteractions, which are small on-screen interactive animations and transition effects designed to keep users engaged while they wait for a response, are an effective way to overcome the issue of Interstitial Anxiety. Whether it is WordPress backend or frontend, Microinteractions are now being used everywhere at a large scale to make user interfaces more human-centric and usable. One recent and relevant example of this is the animated red circular arrow icon that comes into view when you update a plug-in in your WordPress dashboard. Get ready to see more such animations in the future! After full-screen interactive video headers, Cinemagraphs are probably one of the most engaging design trends in WordPress so far. Simply put, they’re a mix of still images and moving elements – put together to deliver a more emotional and appealing user experience to website visitors. However, they are totally different from GIFs in terms of quality, engagement, and execution. Some great examples of stunning Cinemagraphs can be seen following this link. Came into existence last year, this new type of visual medium is already quite popular on social media channels such as Google+ and now it is slowly moving away towards WordPress websites also. Although a Cinemagraph creates a similar effect to video headers in some cases, still it keeps both website and server less busy than a video header or video background. Given its growing use in WordPress themes, this trend is expected to become even more popular in 2017. Hopefully, you’d find this article useful and informative. You can place your order now for our PSD to WordPress service to get your design files converted to a well-functioning responsive WordPress theme or you may contact us via our contact form for any query.